The Hudson’s Bay Company Gallery is the showcase for ‘Manitoba’s National Treasure’ the Hudson’s Bay Company Museum Collection. The Collection was gifted to the Museum in 1994, together with the Company’s commitment to ensure its future care. The new wing, which houses the Collection, was completed in 1998 paving the way for development of the public gallery. With new interpretive links to the Nonsuch Gallery, the Hudson’s Bay Company Gallery tells the story of one of the oldest commercial enterprises still in existence and the incredible impact of its commercial undertaking on the history of Canada. The artifacts reveal an amazing story that includes the quest for the fabled North West Passage and the establishment of a trading empire encompassing a vast area from Labrador to Vancouver Island to what is now the northwestern United States, even touching on Alaska, Kamchatka, Hawaii and China. Visitors to the gallery will enjoy highlights from this unique Museum Collection and discover the past throughout the lives of the remarkable people who worked in the world of the western fur trade. 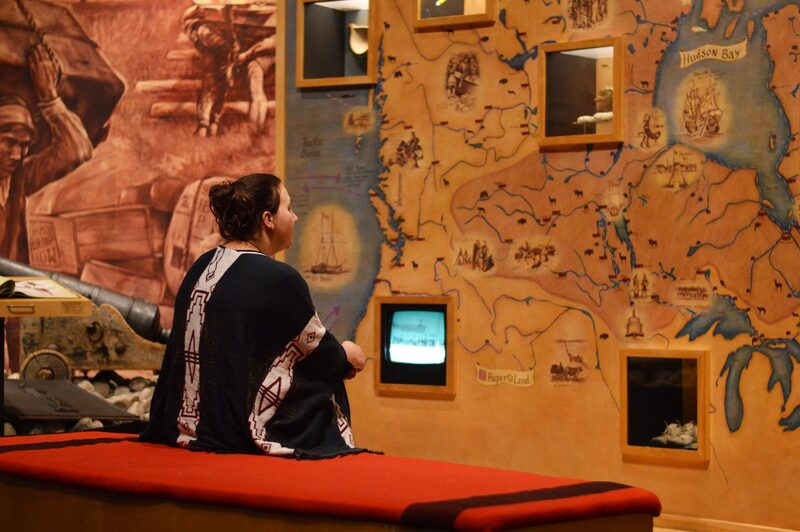 The daily activities, partnerships and legendary deeds portrayed in the Gallery bring to life the history of northwestern North America and the building of the Canadian nation from sea to sea to sea. On May 2, 1920, The Hudson’s Bay Company marked the 250th anniversary of the granting of the Charter to “The Governor and Company of Adventurers of England Trading into Hudson’s Bay” by King Charles II. The Company celebrated this event by publishing the first issue of the Beaver Magazine; preparing a short history of the company; holding commemorative events at Lower Fort Garry; and by contracting Francis David Wilson, a former District manager for James Bay “to collect historical relics, lore, and souvenirs of the early history of the Company” for a museum. The collecting of natural history specimens, human history artifacts and visual material relating the Company’s activities in North America was well established by the twentieth century. Not only had the Company acquired materials for exhibition at its London headquarters, but many of its North American employees accumulated their own private collections. Sir George Simpson, Governor of the Northern Department from 1821 to 1826 and of the trading territories in British North America until 1860, not only acquired materials for his personal collection, but was also a patron of Canadian artist Paul Kane and ordered both artwork and “curiosities of the country” reflecting the natural history and lives of Aboriginal nations in the western regions of Rupert’s Land. In addition to preserving a record of the Hudson’s Bay Company’s contribution to the development of British North America for posterity, the collections and their exhibition were considered to be the Company’s legacy to all Canadians. The Hudson’s Bay Company cared for the collections in a professional manner, employing the museological thinking and standards of the day. The exhibition became one of the first major public museums in Western Canada. The initial collections were regarded only as a beginning to future acquisitions. A general appeal was made to friends both within and outside the service of the Hudson’s Bay Company for objects to fill in the gaps. The Hudson’s Bay Company Museum Collection is Manitoba’s National Treasure and it spans three centuries of the Company’s colourful history and contains more than 10,000 artifacts. Initiated by the Company officials in 1920, the Collection is one of the world’s most significant historic resources. One-half of the Collection originated in First Nations, Métis and Inuit communities and illustrates traditional lifestyles and unique adaptations to the world of the commercial fur trade. These artifacts were acquired by the Hudson’s Bay Company through purchase, trade, ceremonial gift exchange and donations from fur traders and their families. A Fine Art Collection features 17th century antique maps and watercolours by Peter Rindisbacher painted at Red River in the 1820s. Twentieth century works of Canadian artist John Innes, Inuit carvings and prints are among the treasures. In 1994, the Hudson’s Bay Company donated its historic Museum Collection to The Manitoba Museum for the benefit of all Canadians. This “gift to the nation” was made with a commitment to ensure its future care and accessibility. The Museum has mounted two exhibitions of the Collection, the first in 1995 and the second in 1997. His Royal Highness the Prince of Wales dedicated the new museum facility in 1996, the building to house the Collection, research facility and public gallery was complete in 1998 and the Hudson’s Bay Company Gallery opened May 2, 2000. The gift of the Hudson’s Bay Company Museum Collection and its supporting funding is the largest corporate donation ever received by the Museum. Together with the Nonsuch replica, the Hudson’s Bay Company Museum Collection establishes the Museum as an international centre for northwestern North American fur trade research, and a major cultural tourism destination. Visit the Provincial Archives of Manitoba and the Rupert’s Land Centre at the University of Winnipeg.